Abidjan, Ivory Coast is the scene of the annual European Union-Africa Summit where the centuries-long crises of relations between the two continents has reached a tipping point with the escalation of human trafficking in Libya stemming directly from the Pentagon-NATO destruction of the North African state in 2011. In this year’s gathering, the fifth of such meetings, the African Union (AU) has gained official recognition as a continental body. 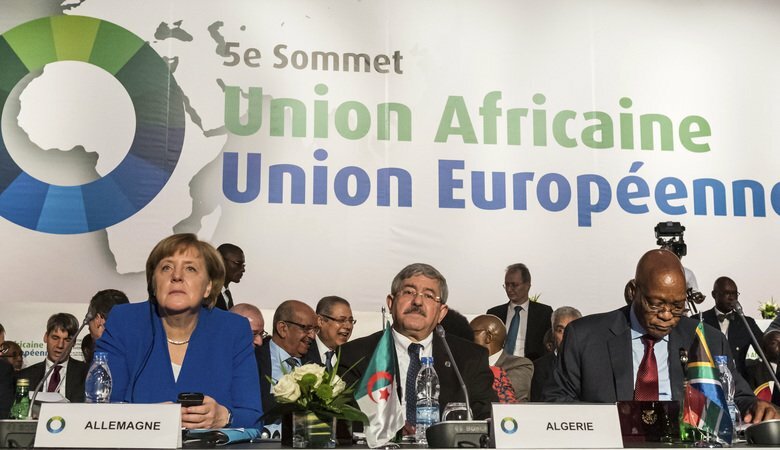 In previous summits due to the desire by the EU to exclude certain states, the participation of African governments was based on an invitation-only basis. However, beginning on November 29, both regional institutions sat down to negotiate new agreements on the migration of Africans from their homelands into Europe where an estimated 1.5 million people have traveled since 2015 only to be largely met with racism and national discrimination by EU member-states. Thousands have died in the Mediterranean due to sub-standard vessels in which people have paid thousands of Euros to travel across the waters to an uncertain future in the historical centers of slavery and colonialism. Despite the concerns prompted by corporate media exposures of the recrudescence of the Atlantic Slave Trade, the actual causes underlying the contemporary crisis remains hidden through platitudes of concern by the leading EU states such as Germany and France along with their principles allies in Africa whom remains dominated by neo-colonialism. Although most African states gained formal independence decades ago, the economic and consequent political policies of these states are still largely dictated by Western European and North American imperialist governments. Ironically the host of the EU-AU Summit President Alasane Ouattara of Ivory Coast was himself installed through French imperialist intervention in the early months of 2011. The previous head-of-state, President Laurent Gbagbo, was overthrown at the aegis of paratroopers deployed from Paris. Gbagbo is now imprisoned in the Netherlands where he awaits trial at the International Criminal Court (ICC) in The Hague over alleged crimes committed in Ivory Coast. His wife, former First Lady Simone Gbagbo, a political figure in her own right, was railroaded through the unjust imperialist-controlled court system in Ivory Coast where she is serving a 20-year prison term absent of any identifiable criminal wrongdoing. The ICC has been accused of racism and bias by numerous AU member-states due to its preoccupation with events on the continent while war crimes and genocidal policies carried out by the imperialist states of the West in Iraq, Afghanistan, Libya, Syria, Yemen, Haiti, etc. have not even been investigated by the ICC let alone being the subject of sanctions, arrest warrants, indefinite detentions and show trials. Only one African state has been able to withdraw from the jurisdiction of the ICC being Burundi which is facing retribution by the West. Nonetheless, the gathering of these 55 AU and 28 EU nations is not prepared to discuss the development of a new political and economic arrangement that could re-correct the six centuries-long disproportionate control by Europe and its descendants in North America over Africa. German Chancellor Angela Merkel and French President Emmanuel Macron may present themselves as representatives of a neo-liberal Europe prepared to “integrate” African migrants, the reality is that the legacy of slavery and colonialism is very much a determining factor in the horrors of the second decade of the 21st century where the worse crises of displacement in human history has been spawned by imperialist wars and gross economic exploitation against the peoples of Africa and the Asia-Pacific. Col. Muammar Gaddafi, the former leader of the Libyan Jamahiriya, was targeted by the U.S., Britain, France, Italy, along with their allies in North Africa and the Middle East in February 2011 for removal. Rebels were financed, armed and coordinated to wage a ground war of terrorism to overthrow the government in Tripoli. Although Libya had given up most of its offensive and defensive weapons in an effort to avoid war with the imperialists during the same time period as the destruction of Iraq in 2003, the Gaddafi forces were able to defeat the counter-revolutionaries chasing them back into their launching base of Benghazi by the second week of March 2011. Not willing to see the triumph of the Libyan military over its agents, the U.S. and other NATO governments went before the United Nations Security Council to pass two resolutions mandating an arms and economic embargo against the Jamahiriya as well as a massive bombing campaign which lasted for seven months. 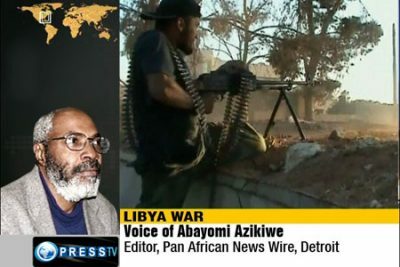 The counter-revolutionaries fighting the Libyan government were labelled as “freedom fighters” attempting to institute “democracy” inside the country. Tens of thousands of Libyans and other Africans lost their lives in the process while the basic infrastructure of the AU’s most prosperous state was destroyed. These atrocities were committed under the leadership of the first “Black” president of the U.S. Barack Obama, who also escalated the presence of the Africa Command (AFRICOM) on the continent, with Libya being its first full mission. Similar to the events in Ivory Coast, there were African governments and non-state entities which supported the recolonization of Libya. Today these same states are suffering from destabilization, the continuing impoverishment of their people emanating from the economic dependency on the imperialist nations. Despite the purported “Arab Spring” seizure of power in Libya, some six years later, the country is one of the most unstable and destitute in Africa. Numerous attempts to configure a compliant neo-colonial dispensation in Libya have failed miserably. In 2017, at least three identifiable sources of putative “authority’ are in existence while militias and criminal gangs roam free throughout the country reigning down havoc upon millions. 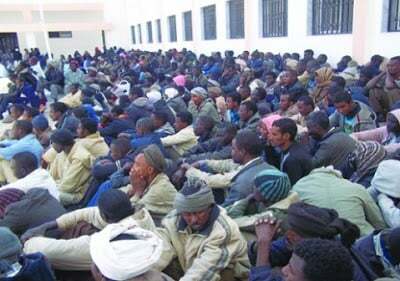 The existence of slave marts in Libya is a by-product of imperialist intervention. This situation did not arise spontaneously and is a natural socially evolutionary process emerging from the failure of world capitalism struggling desperately to exert its influence over the majority of humanity. Contributing to this state of affairs has been the U.S.-NATO wars waged in Afghanistan, Pakistan, Syria, Iraq, Yemen, Sudan, Palestine and other geo-political regions. Islamist “terror” groups were created and promoted by the imperialists. They have been utilized for decades by Washington, London and Brussels through formal networks operating in compliant territories such as Saudi Arabia, the United Arab Emirates and Qatar. The EU-AU Summit cannot solve the problems of African migration. These difficulties can only be eradicated when Africa unites under an anti-imperialist program designed to rebuild the continent based upon its own economic and political interests. This was the contribution of Dr. Kwame Nkrumah, the prime minister and president of the West African state of Ghana which was overthrown as well in 1966 at the aegis of Washington and Wall Street. Later Gaddafi also called for the creation of a United States of Africa in the Nkrumaist mode leaving him open to attack by the same imperialist system. Recently during his tenure as AU Chairperson in 2015-2016, President Robert Mugabe of the Republic of Zimbabwe urged African nations to unite through the construction of its own trading system, currency, political integration and a military force that is independent of the Pentagon and NATO. Mugabe recently resigned from office under pressure from elements within his own political party, ZANU-PF. The degree to which imperialism was responsible for this series of events known as “Operation Restore Legacy”, will become clearer as the actual policies of his successors become evident particularly in the arenas of land reform, indigenization, their posture towards U.S. militarism and the continuation of an anti-imperialist, Pan-Africanist and Socialist-oriented domestic and foreign policy. What remains undisputed is the historic role of Europe in the underdevelopment of the African continent. Therefore only the genuine independence of Africa from this system of exploitation and national oppression can bring about true freedom and liberation to its people.